If the goal of education is to prepare students for the future, then nothing brings this reality home more than hosting a career day at your school. You can start simple, make it personalized for your community of learners and build your program year by year. Here are 50 career day ideas and activities to get your students excited and engaged. Form a Committee - Recruit helpers to organize your day and bounce ideas around, because planning a good career day takes a village. If you have multiple grade levels participating be sure everyone is represented. Set a Date - Pick a date that works well with your school and community calendars by considering test dates, school breaks and group events. Also, make sure to set a start and end time for the day. Choose a Format - Determine how your presenters will interact with students. Speakers can visit individual classrooms or homeroom classes can rotate to speaker locations. Students can even break up into smaller groups to conduct short interviews with presenters in a “speed dating” style. 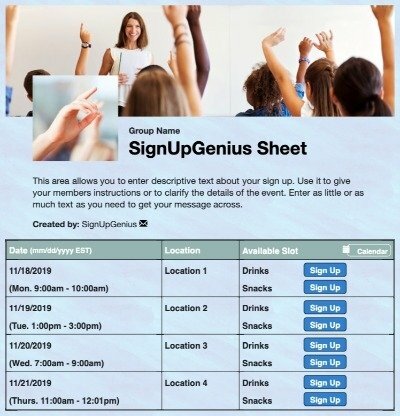 Genius Tip: Create a career day presenter sign up to coordinate the different sessions throughout the day. Consider Career Interests - Engage students by rotating them to speakers based on specific career interests. This can be more work up front but is extremely valuable for older students. Involve the Community - Be sure to invite your superintendent, members of the school board, community relations folks and a photographer from a local paper. Use this community event to get the word out about your school! Coordinate Rooms - Determine how many classrooms will be available to use including common areas such as the library, cafeteria and computer lab. Once you decide on the presentation style (large or small group), begin to make a master list of how many presenters you will need. Make it Unique – Incorporate your school’s emphasis and teaching philosophy, by covering relevant and timely topics. For example, you may want to include guiding character traits, seek out presenters who represent different areas in the theory of multiple intelligences, follow a curriculum that is available online or create a framework based on a subject you are currently studying. Research Presenters - It never hurts to research potential presenters by viewing online feedback about their company or their individual customer/patient reviews. Great presenters will enjoy the age they are presenting to, want to be interactive and may even bring free stuff for the kids. Who doesn’t love free stuff? Ask for Suggestions - Get referrals from your faculty and students (you can also send a letter home to parents asking for volunteers) and also follow up with emails and verbal reminders to solicit suggestions for presenters. Sometimes it takes asking twice (or more) to get responses. 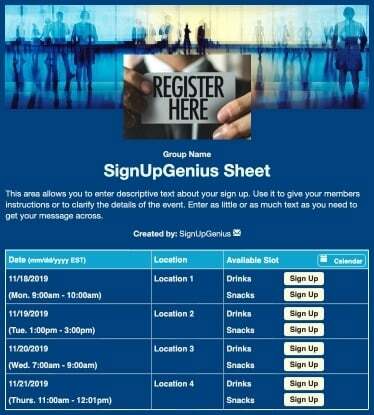 Also, contact college admissions and recruiting departments in your area to ask for suggestions then reach out to invite the top presenters to participate. Communicate Early - About three months out you should contact presenters and give them a schedule with details about what you are hoping they will contribute to the day. You may also consider including a basic overview of questions to expect about their career. Finalize Details with Presenters - One month before the event, confirm your presenters and ask them to submit their equipment or space needs. A week before the career day, email a school map with parking information and where to go first thing when they arrive. Ask for a reply and if you don’t hear from them, contact them in case there has been a date conflict or mix-up. Give Presenters a Guideline - Also one month prior to the event, email or mail your presenters guidelines for talking points. Suggest for presenters to start their session by telling “three truths and a lie” story about their career (a list of three unique true facts and one that is a believable lie). Survey Students - For older students, a guiding factor for inviting presenters could be giving students a career inventory or interest survey and letting that guide your decisions about presenters. Choose a Theme - Give your career day a theme and use it as a framework for picking activities. Examples of themes: Passport to Success; Start Your Engines; Up, Up and Away; Constructing your Future or Ready, Set, Action! Select Student Ambassadors - Consider having a student ambassador for each professional who will be joining you. Have the student help with getting them to their presenting space, locating the hospitality room, directing them to restrooms, introducing the presenter or helping presenters be aware of time restraints by discreetly giving them a two-minute warning. Involve College Representatives - For older students, invite a few college representatives to promote higher education for achieving career goals. Contact their admissions department to see if a representative is available and if not, ask for a school poster and free giveaways. Again, everybody likes free stuff! Set Up a Hospitality Room - Ask your PTA or homeroom parents to set up a hospitality room for presenters. Parents will enjoy the opportunity to show their appreciation, and if your career day straddles a mealtime, it can help keep hunger at bay for presenters. Keep it Local - Include community-specific or even school-specific (like language or fine arts magnet school) information. Try including a local farmer, ski instructor, wildlife manager or human resource employee from a large company in your community. Include Giveaways - Kids will love if you offer prizes for participation. Consider using a spinning wheel and let them “spin to win” for rewards if they answer a presenter’s questions correctly. For medical professionals or beauticians, you can play a “guess how many” game with cotton balls or hair combs in a jar. Follow-up is Key - Get feedback from students, staff and presenters and keep a file of ideas (and favorite presenters) for the next career day. Write thank you notes to contributors and presenters. My First Resume - Task students with creating their first resume using proper formatting and simple headings such as jobs they like to do at home, awards from school or other extracurricular activities and special skills they might have. Jobs on Wheels - Younger students might enjoy learning about equipment, tools and vehicles associated with specific careers. A great book to share is Whose Vehicle is This? by Sharon Katz Cooper. Career Bulletin Board - Use a chalkboard sign and take black and white pictures of students holding up their future career dreams to create a “When I Grow Up…” bulletin board collage. Genius Tip: Need more bulletin board inspiration for the year? Browse these 100 bulletin board ideas. Poster Research Project - Ask students to create a research-based poster of a career interest and use it to decorate classroom or hallway walls. Future Dreams Pennant Banner - To broaden the scope beyond just career goals, ask for magazine donations and have each student create a pennant with cut-out pictures of future job ideas, travel and even a house they would like to live in and words that express their life goals. When the pennants are complete, you can string them all together into a banner to decorate the classroom. Vocational Dress Up Day - Pick a day before your career day to allow students to dress up or bring a small prop that relates to a career. Include time in the day to share with the class or grade level, if appropriate. Seasonal Vocational Parade - Each student gets a coloring page with a seasonal character (pumpkin, snowman, spring bunny) and decorates it with a vocation in mind. You can display these in hallways during the career day, thus creating a “parade” of job-related characters. Get to Know your Neighbors - Inspired by this great throwback video, get a large piece of craft paper to draw a neighborhood (or business area) in your town and list potential jobs related to that area. “Hello, I’m a…” Nametags - On career day, create colorful name tags for students with an occupation of interest (you can also include names, which makes it easier for presenters to call on them). Professional Character Vocabulary - Have presenters grab a slip of paper from your “grab bag” with character traits of professionals such as punctuality, flexibility, accountability, attitude. Have them share this attribute with their students and explain why this attribute is essential for success in their field. Who’s in My Office? 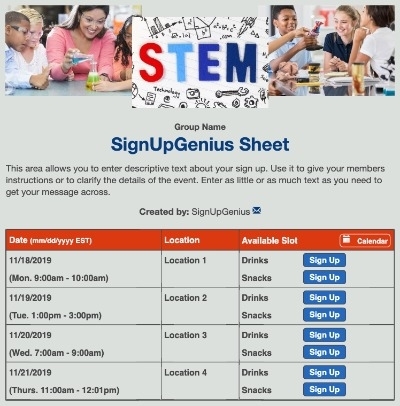 - Take a job description and ask students to brainstorm other roles that would be connected to that job as you draw out a flowchart on the whiteboard. For example, you could start with an advertising account executive and list out potential clients, people in the art department and outside contacts who would buy ads. When you’re finished brainstorming, you’ll have a whiteboard full of job ideas! Three Perks and a Challenge - Ask students to fill out a prediction page for each presenter, guessing three positives about the job and one challenge. Give the presenter time to ask students about their predictions and see how they match up with reality. Character, Class, Craft - Have students create a booklet and for each presenter have them note a necessary character trait a professional must have to qualify for a similar job. Students can list classes they might need to take to prepare them for that specific job. Alphabet Chart - During downtime between presenters, have students or groups of students complete an alphabetized chart of careers. Print out a chart with one letter of the alphabet in each box, and have students fill in careers that start with each letter. Career Crossover - To help students process career day information, gather together to create Venn diagrams to explore similarities and differences in the careers they heard about. If they heard about computers and art, designing computer games might be a good career; if they like pets and psychology, maybe they could be an animal behaviorist. This activity helps students think outside the box and apply what they learned. Make a Legit Resume - Many older students don’t realize how their outside activities, volunteer work, jobs and awards are important resume fillers. Assign a beginning resume and challenge them to keep their eyes open for resume opportunities. Career Survey - One of the best activities to do before a career day is to simply get kids thinking about their personal interests and goals. Use a free online survey such as MyPlan.com or a career cluster survey like this one. You can also enlist the help of a local career center. “Grads You Know” Display Wall - To help students see the variety of institutions represented at their school, create a large wall-sized bar graph with universities listed along the bottom and pictures of the school staff who attended the institution stacked above it and make a special “Grad School” tag for those who went on to advanced degrees. Where Will You Be at 33? - Have students create a life profile of how they envision themselves in the future (this can be a project-based activity). Include college, career, geographical location, even family or hobby goals. Browse CareerOneStop Activities - Sponsored by the U.S. Department of Labor, the GetMyFuture section of CareerOneStop is a valuable resource for all kinds of career-related questions such as how to apply to college, how to write a resume or how to be self-employed. Career Cluster Bulletin Board - Students can participate in this interactive bulletin board activity each day. Choose a general career category such as “Health Sciences” and challenge students to bring in pictures, articles and ideas about careers related to this general category. Change the category out weekly as your career day approaches. “Get a Job” Day - Before anyone can start a career, they have to learn to nail an interview. Designate a Friday before your career day where students wear professional dress and role-play by taking turns being the employer and the job seeker. Students can learn what to share and how to keep from oversharing in an interview, what experiences to mention and the importance of social media content. If I Hadn’t Been A Teacher... - Before career day ask teachers to tell the class about other jobs they considered besides being an educator and why. Have them share their journey to becoming an educator, which some students may find inspirational. “Do This Not That” Interview Skills - In each presenter’s room, set up a poster with “Do This Not That” interview tips such as appropriate shoes, facial expressions, what questions to ask/not to ask, etc. Questions Grab Bag - To keep questions appropriate and brief, consider gathering questions from students ahead of time and creating a question grab bag for each room/presenter. You can also give presenters the questions ahead of time; they will appreciate this! Fast Tracks to Careers - If your high school offers college credit classes pertinent for certain careers, advertise those opportunities along with trade programs offered at your school or in your community. As a presenter wraps up their presentation, they can share these educational opportunities, or a school counselor can make a quick plug for the program or class. Career Challenge Brainstorm - Encourage presenters to address a real-life challenge they face in their career and give students a chance during the presentation to brainstorm ways to overcome that challenge so they get a taste of reality. Career Scavenger Hunt - Help students stay engaged with the presentations by creating scavenger hunt challenges for the students to complete during the course of the day. You could hand out scavenger hunt bingo cards with items like “take a selfie with a female engineer” or “ask an EMT about their craziest on-call story.” Genius Tip: Get inspired with these 100 general scavenger hunt ideas and tips. Presenter Thank You Notes - Have students participate in writing thank you notes to your presenters after the event. Remind students that thank you notes are a great way to follow up with potential employers after job interviews. Career Field Trip - A great follow-up to career day is taking a field trip to a job simulation “town” where students can explore specific careers hands-on. Research your local Junior Achievement program to see if there is a “BizTown” near you, or consider a virtual field trip through an interactive online job exploration experience like Kids Work. Career days provide valuable real-world interaction between students and professionals in your community. Not only can you get students thinking about the education and character traits of a professional, but you can jumpstart dreams for their future. Organize career day presenters with an online sign up.